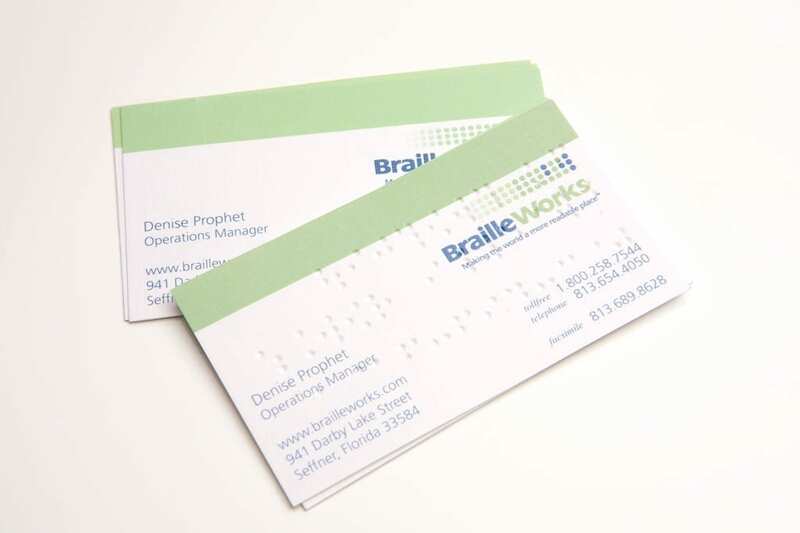 The majority of the time your business card is the only thing a potential client takes away from a meeting with you, so make yours unforgettable by adding braille! We print and emboss braille business cards from scratch without the use of labels, leaving you with stylish, professional business cards that can be read by anyone, sighted or not. Braille and Print: Send us your camera ready artwork in PDF format and we will print and braille your business cards. We print one or two sided cards in color or black ink, the choice is yours. Braille is embossed directly onto thick and strong 80 lb. white cover-stock. We also offer graphic design services if you need your business card artwork created. 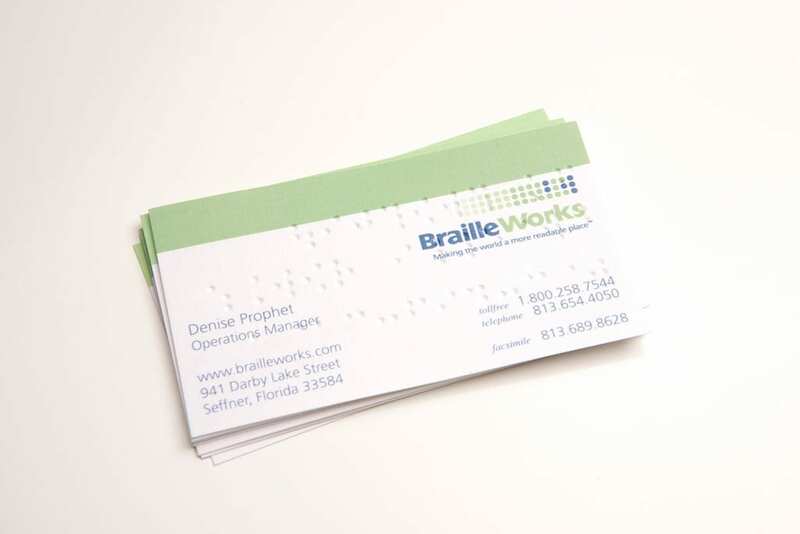 Note: For print vendors, we can add Braille to your existing business cards that have already been printed, as long as they are not cut and are still on an 8 ½ x 11 inch sheet with trim-marks. 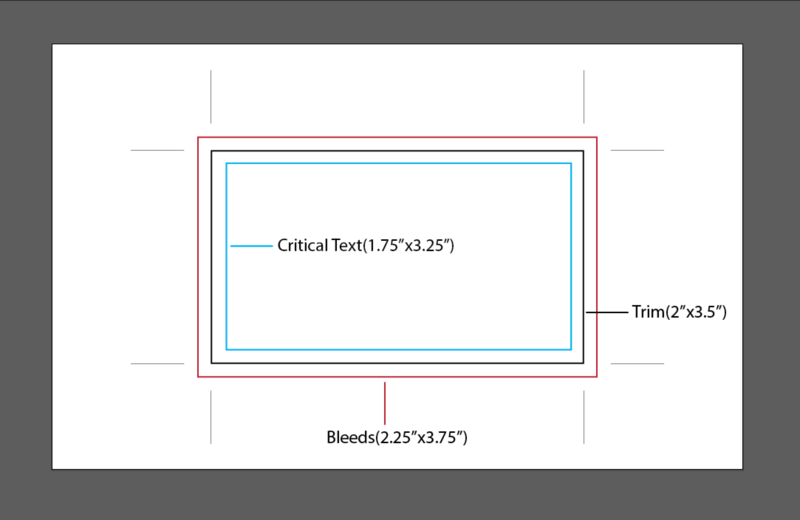 Here’s a blank template you can download for reference if you like. To make sure the Braille is always crisp, clean and easy to read; we only emboss on 80 lb. cover (no gloss or UV coating). To place your order, simply fill-out the form. You can also e-mail us directly or give us a call at (800) 258-7544. 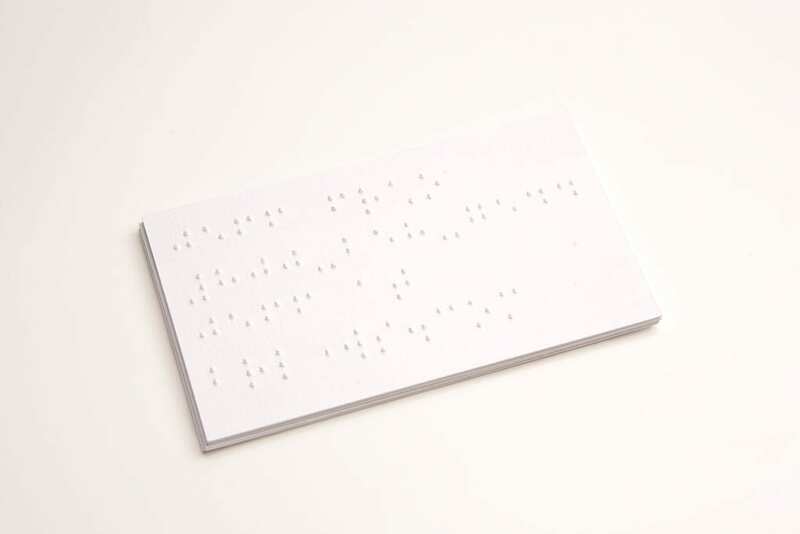 We braille up to 4 lines, 13 characters per line, on a standard-sized business card (3 ½ x 2 inches). This includes spaces and every capital letter requires 2 spaces. Text can wrap several lines if needed. The minimum order size for braille business cards is 250. Full color is available as well as grayscale (black and white), the choice is up to you. All braille business cards will display regular print and/or logo graphics on the cards and braille is embossed on the back.